Patti Burns, a Pittsburgher who emerged from the shadow of her legendary father to become a respected and beloved TV anchor in her own right, died yesterday at her home. She was 49 and had been diagnosed with lung cancer in April. In a town that reveres its sports heroes and media personalities more than most, the onetime reporter and news anchor was akin to royalty. Older viewers loved her like doting grandmothers or mothers and took it personally when she and KDKA parted company in 1997, after nearly 23 years. Baby boomers aged with her, noting her changes in assignments, hairstyles, jewelry and beaus, and mourned when her father, Bill, died.Her contentious split from Channel 2 almost five years ago was a major news story, and KDKA yesterday devoted the first 15 minutes of its 5 p.m. newscast to her death. More on this story Click here for a photo journal tracing the career of Patti Burns. Click here to listen to an audio tribute to Patti Burns by KDKA reporter Dave Crawley. “She never said, ‘Why is this happening to me?’ She never talked about fear or anger or anything you might expect from somebody who’s 49 years old and looking at something as frightening as this was. She had absolute grace during these long months, and I really loved her.”Even as a 7-year-old, Ms. Burns made headlines. In September 1959, she ducked out of her Mt. Lebanon home to avoid a baby sitter and a bath, fell asleep in the bushes in the back yard and ignited fears she had been kidnapped. Patricia Jeanne Burns was part of the country’s first father-daughter anchor team. She was an award-winning reporter who covered the end of the Vietnam War and its fallout, accompanied the Pittsburgh Symphony Orchestra on its 1987 trip to China, met Pope John Paul II, chronicled national political conventions and investigated local stories with equal aplomb. Jim Esser, a former KDKA producer now retired and living in San Francisco, accompanied her to China.In Tiananmen Square, Esser said, they were swarmed by a group of schoolchildren about 6 years old. “Patti got down on her knees and started talking with them, she in English and they in Chinese” while Esser and photographer Ken Sims fidgeted, fearful that Chinese police would happen along at any second and descend on them. Esser said Ms. Burns had the rare ability to be professional one minute, fun-loving the next. “She loved her audience,” he said. “She thought the people of Pittsburgh were the best people in the world, and she always had time for them. “I got the feeling she was everybody’s daughter. And every Pittsburgh mother wanted her son to bring Patti home. She used to talk through the camera to the people.” She talked to them while they nibbled lunch, prepared dinner, got ready for bed. She joined KDKA in July 1974 and left on an appropriately chilly day in January 1997. During her tenure at the station, she was a reporter and anchor for the noon, 6 and 11 p.m. newscasts.”Being a native helps in the pronunciation of the local names and knowing locations of things,” she once said. “But more importantly, you take it personally when something happens to a community or an area. … I love this city.”In September 1979, she appeared on the cover of Pittsburgh magazine with the headline: “Patti Burns Grows Up.” Clad in a silky blue shirt, fitted jeans and metallic gold belt, she posed with her hands (manicured nails painted pink) on her slender hips. The story said, in part, “It’s been a rise both steady and rapid for Patti Burns, especially noteworthy in a business so marked by personnel turnover. That Channel 2 hired her so young may have had something to do with her father; that she has succeeded so quickly has been a product of her own talent and tirelessness.””She was a real professional,” said Ray Tannehill, now retired but long her co-anchor. “She learned well from her father. She was a stickler for detail. If somebody made a mistake, they heard about it. A graduate of Mt. Lebanon High School and the University of Denver, she launched her career at WFAA, the ABC affiliate in Dallas. She told the Post-Gazette in 1979: “I loved it. I’ve never wanted to do talk shows or anything else. News has always interested me. Dad has said I have a natural curiosity, the desire to pursue a question, to want to find out.” In the Pittsburgh magazine profile, she recalled dealing with a longtime Dallas anchor who was unkind to her, sometimes correcting her on the air, sometimes sending her to the ladies’ room in tears. She was making $150 a week, and when WTAE came calling, she was homesick and ready to listen. “Then Westinghouse got wind of it and all hell broke loose,” she recalled. “I was getting calls from the president of Westinghouse,” then KDKA’s owner. She, her father and her older brother, Michael, who was then her attorney, decided she would be better off at KDKA, where Bill Burns had helped to invent and shape the nascent TV news business. A July 4, 1974, newspaper article noted that Patti Burns had signed a contract with KDKA. It quoted the station’s general manager as saying, “We have been scouting this young lady for 22 years — all her life….” She started as a reporter. 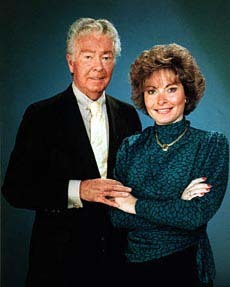 When she and her father joined forces to anchor the noon news in 1976, “Patti and Daddy” became the only father-daughter anchor team in the country. “There was laughter,” Julius said of Ms. Burns, “but there was a respect for the business. Not many people had that. I think the old man had tremendous influence on her. He lived and breathed the news business. She got that from him. “She had great news instincts. Even when she first came [to KDKA] as a reporter, she was more concerned with the story than with ‘face’ time. Her words about life being short sadly proved prophetic. But she never gave up on Pittsburgh — or broadcasting, for that matter. Ms. Burns was among the first contributors to “On Q,” WQED’s nightly TV newsmagazine that went on the air in January 2000. She brought name recognition, gravitas and a lifetime’s worth of contacts, while the station provided time to report on lengthy stories dealing with the resurgence of the region. She also created and ran Burns Communications, a media training and video production company. Among her first projects were a short recruiting video for Carlow College and a public service announcement about the importance of donating blood for the Central Blood Bank. She later produced and appeared in commercials for the Western Pennsylvania School for Blind Children. She also volunteered at Radio Information Service, which serves visually and physically impaired listeners. She worked for a wide range of charities and causes, including Animal Friends, St. Peter’s Child Development Centers and Magee-Womens Hospital Foundation. She was chosen by Carlow College as its first Woman of Spirit and awarded honorary doctorates from Rollins College in Florida and La Roche College.Unshackled from the anchor desk, Ms. Burns was enjoying life with her husband, Charles C. Cohen, a senior partner in the Downtown law firm Cohen & Grigsby. She was spending more time with her mother in Naples, Fla., friends in Pittsburgh and her two Shetland sheepdogs. Ms. Burns, impeccably dressed and coiffed as always, and Cohen were frequently spotted at local social events. Ms. Burns spent much of 1997 working on the Regional Renaissance Initiative, an unsuccessful plan to fund stadiums and other projects with a regional sales tax. Even as she faced an uphill battle for the initiative, she said she had never been happier. “My life is so full of so many different things — things I was never able to do when I was working for KDKA.”In October 1998, she introduced a video she had made for the Henry J. McGonigle Distinguished Speaker Series. It was about a topic she knew all too well. “The Ethical Dilemma of Television News: Profits vs. Journalism” was a mini-lesson in the rise and changes in TV news. Through interviews, analysis, archival news footage and experience, she concluded that profits had become the driving force of the business.At the time of her death, it had been nearly five years since Ms. Burns last sat behind an anchor desk at KDKA. Her plans to leave had been the worst-kept secret in town, although her actual last day on the air caught her and viewers by surprise. She had talked about leaving in early 1996, although the parting wasn’t final until she and KDKA failed to reach a new contract. Her last day of work was Thursday, Jan. 16, 1997. It was the end of a family and broadcasting era, and she steeled herself for the occasion.She worked that day with co-anchor Tannehill and meteorologist Bob Kudzma, telling them, “Well, Bob, Ray, my friends, this is the time to say good-bye.” She turned her attention to the viewers and thanked them “for allowing me to work with my father, to come into your home each and every day with good and bad news for our area. “It has been a great honor and a great privilege,” she said. “Good-bye.” An emotional Tannehill told his on-air partner it had been a “great 20-year ride.” He patted her hand and asked who was going to watch over her. “I don’t know, I don’t know,” she replied. But Ms. Burns could watch over herself — and she had Cohen, the attorney who would become her husband late in her life, as her protector. The couple were married in the chambers of Judge Bernard McGinley on May 18, after she was diagnosed with cancer. She discovered a lump above her collarbone that proved to be an enlarged lymph node. It was removed and found to be malignant. There were signs the cancer had spread, but Ms. Burns, a longtime smoker, hoped that a combination of radiation and chemotherapy could arrest the disease. Ms. Burns is survived by her husband; her mother, Jeanne Burns of Naples, Fla.; and her brother. A memorial service will be held in Oakland on Dec. 9. Washington won six in a row; split the next four; and lost the next six; Way Up and Way Down; from 6-0 to 8-8; the Redskins did not make the playoffs. The Eagles after seven games were 4-3 and went 5-4 thereafter. The overall record of 9-7 meant Philadelphia made the playoffs for the first time since 1960. One Punt in the Redskins game… Punter Mike Michel took the snap from Center, released the ball, raised his right leg, and missed the ball completely. Not before or since have I seen a play like this.